Lose yourself in relaxation as 46 targeted jets deliver powerful hydrotherapy. You’ll love all the features of this Healthy Living hot tub, including the lounge seat, cascading waterfalls and beautiful lighting. Mast3rPur™ Water Management System: This water management system is a synergistic blend of three proven natural water sanitizers that when combined makes them dramatically more effective through a chemical reaction known as Advanced Oxidation Process. This results in clean, clear, fresh smelling, and silkier water. The Mast3rPur™ option is only available on spas equipped with the QuietFlo Water Care System. QuietFlo Water Care System: Our energy-efficient circulation pump circulates up to 30 gallons of water per minute. This advanced system enhances the purity of the water while interacting with the heater, ozone system, patented EcoPur® Filtration System, as well as the optional Mast3rPur™ Water Management System. 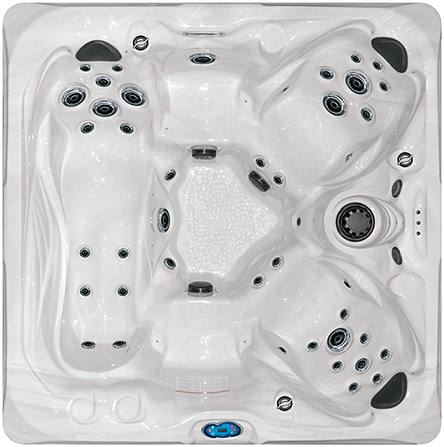 Fusion Sound System: Most Healthy Living Hot Tubs may be equipped with an optional sound system so you can listen to your favorite music while rejuvenating your body and mind. Match the color of your spa with the skirting of your choice for a distinctive combination that’s truly your own. Choose from our selection of DuraMaster Premium™ polymer skirting colors. For the ultimate in luxury, choose the convincing DreamStone™ synthetic rock skirt. Weight Dry: 755 lbs. / Full: 4,225 lbs. Probably the most comfortable hot tub I have ever sat in. The neck and shoulder jets feel amazing. It is more of a 2-3 person tub, unless you are comfortable with more that you would be sharing with. I will say however, this tub is pretty self sustaining. Easy to take care of the water. Low chemical usage as well.